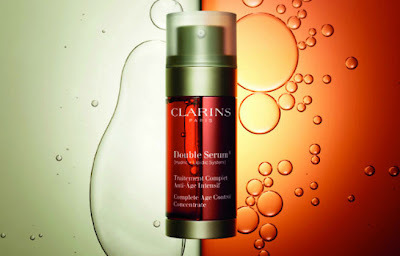 According to Clarins, this is more than just a simple serum, it's a complete, double, anti-ageing concentrate. It contains twenty plant extracts which help to stimulate all of the skin's vital functions, aiming to assist with firmer skin, reduced wrinkles, a more radiant and even complexion and a reduction in pores/pore visibility. The "double" in the "Double Serum" moniker comes from the fact that it's both a Hydric and a Lipidic system. 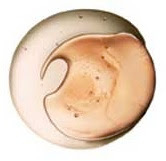 What this means is simply that it contains both water- and oil- soluble anti-ageing active ingredients. This serum comes in a container pump dispenser with two sides, one containing the hydric (water-soluble) ingredients, the other, the lipidic (oil-soluble) ones. To use it, you pump out one or two pumps and you'll get both serums dispensed together; mix it in your hand and apply as usual to your face, underneath your day/night-time moisturiser(s). The texture is a good deal oilier than I'm used to and it does smell quite strongly, nothing offensive but definitely quite strong and quite sweet. What I found, using it for a couple of days, was that my skin didn't thank me for it - it was way too heavy (oily) for me, personally. This might be a product however of the formula and the super-hot-and-sunny weather we've been enjoying hugely (!) in Ireland of late - my skin has decided to go into sebum overproduction mode as a result, so I don't need something this heavy on my skin - and I have found this has contributed overall to some additional congestion in my t-zone in the couple of weeks I have been using it. Fast forward to some further discussions with other ladies using this product, and my Clarins SA, and I've discovered that while it's labelled a serum, most people have found that it really is better used as a treatment serum, maybe once or twice a week rather than each day. So perhaps it's one I can revisit in the winter time, when my skin does its drying-up-to-a-dessicated-leaf trick. Around about January, then :-) I guess the hint is in the name: anything labelled as a "concentrate" is unlikely to be needed every single day. On the other hand, I have mild rosacea and sensitive skin, and it most certainly didn't aggravate either condition or cause any flare-ups, so that's a good thing. Overall I would say this would suit skin that perhaps needs more moisturisation, it's really one for mature skin and dry (up to normal) skin I think, rather than an early preventative-ageing product, and most certainly I wouldn't use it on younger, or combination or oily skins - it's just too heavy. It doesn't appear to contain any nasty ingredients like parabens, and it doesn't list silicone(s) or alcohol. What it does contain are a bunch of flower- and fruit extracts, and a lot of different oils/oil extracts - all in line with Clarins' usual stance on using natural and plant-based ingredients in their products. It does also contain mineral oil however (and second on the overall list of ingredients) - if this doesn't bother you, fine, but I would prefer not to see it in a good skincare product, personally. It lists hyaluronic acid close to the end of the ingredients listing, so that will help with the overall skin plumping claim. At €69.50 for 30ml this isn't cheap, but it's not ridiculous money for a good serum either. There's a GWP promotion on at the moment in Brown Thomas - if you purchase the serum you will get complimentary travel sized day and night moisturisers and a carry bag. You'll find more information on it here. It's not for me, but I can see it being really good if your skin type is dry and/or mature.